Retro style kitchens are a popular decorating trend and so restoring antique refrigerators has been more in demand in recent years than ever before. Before modern refrigeration people preserved food using an ice box. An ice box was a handsomely designed piece of furniture made of wood with hollow walls lined with tin or zinc. The walls were then packed with insulating material such as straw, sawdust, cork or seaweed. A compartment near the top corner held a large block of ice. Cold air from this compartment would circulate around the other compartments inside the ice box, keeping everything inside cool. Some models of ice boxes had a drip pan to catch melting ice water that would have to be emptied every day. Fancier models had a spigot that would drain the melted ice water into a holding tank. No matter what type of icebox a person had, the water would have to be drained often. The technology for refrigeration was actually a process that began originally in 1748, at the University of Glasgow. A man by the name of William Cullen demonstrated the first known concept of refrigeration, where a liquid is rapidly vaporized through compression. The quickly expanding vapor uses kinetic energy, drawing this energy from the atmosphere in the immediate surrounding area, causing a drop in temperature. Cullin's discovery was not used for any practical application at the time. The first refrigeration machine was designed in 1805 by an American inventor named Oliver Evans. However, it was a man by the name of Jacob Perkins who built the first practical refrigeration machine in 1834. In 1844, a physician who was treating yellow fever patients by the name of John Gorrie, built a machine based on Oliver Evans' design that would cool the air in the facilities housing his sick patients. Gorrie might be credited with inventing the first refrigerator, however, there were still a few other important contributors to modern refrigeration. Carl von Linden, a German engineer, patented the process of liquefying gas in 1876, which is an important part of refrigeration. Two African-American inventors, Thomas Elkins and John Standard made improvements in refrigeration design in the late 1800s. Many people are interested in restoring antique refrigerators to use in their kitchens today. The restoration of an antique refrigerator is an involved and complex process and it's important that an expert does it correctly. A big reason is because refrigerators from the late 1800s through 1929 used toxic gases such as ammonia, methyl chloride and sulfur dioxide as refrigerants. There were actually fatal accidents during the 1920s resulting from methyl chloride leaking out of refrigerators. During the restoration process, the refrigerator is carefully dismantled and each part is cataloged. The old insulation is discarded and replaced with new insulation. All of the electrical wiring is inspected. The exterior shell can be sandblasted to remove years of dirt, grime, rust and old layers of paint. Repair work will remove any dents or damage. Then the exterior shell can be painted the color of your choice. When it comes to the actual refrigeration unit, it will be determined whether the original system can be refurbished or if it needs to be replaced using modern and environmentally friendly refrigerants. In most cases, even if you're buying an authentic antique refrigerator and having it restored, you can have these vintage style appliances custom built to match the rest of your kitchen's décor. 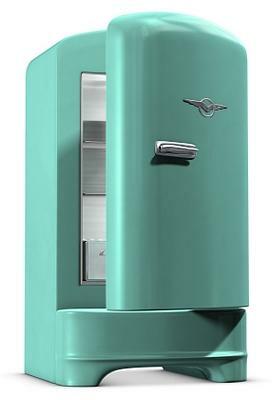 So whether you're going for the retro 1950's style kitchen or a rustic, Colonial style kitchen, you will be able to find the perfect antique style refrigerator you've always wanted.